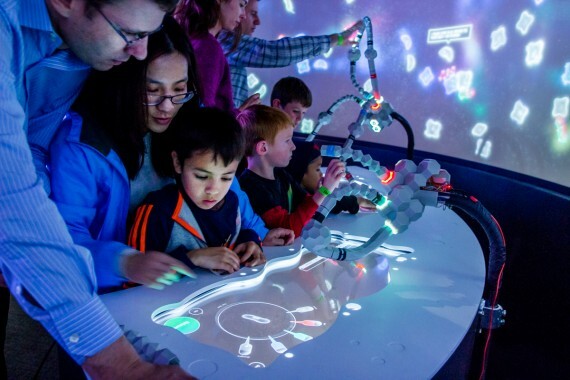 The BioDesign Studio is a new permanent exhibition created by The Tech Museum of Innovation in San Jose and NYC-based experience design studio, Local Projects. For the first time ever, it makes the burgeoning — and complex — fields of synthetic biology, bioengineering, biological design and DIY biology accessible to the public in an engaging and tangible way. To demystify these cutting-edge fields and technologies, visitors are able to play, tinker and design with the building blocks of life…literally. At the Living Colors Lab, visitors use real lab equipment to create their own new life forms at a wet lab, where they can change the colors of live bacteria colonies by adding different types of DNA. Visitors can manipulate genetically-derived behaviors found in nature to create digital lifeforms at the Creature Creation Station. Using physical blocks that represent real genetic functions, visitors construct their cell and release it into an immersive digital environment. The exhibit’s open-ended structure allows users to choose their own goal for their creature, as well as how it lives or dies through interactions with other visitors’ creations. The Pattern Design exhibit is the first in a museum to interactively visualize the Turing Patterns, evolutionary theorems developed by the father of computing Alan Turing. Visitors can create stripes, spots, and patterns by manipulating cellular behavior using software that brings this pioneering evolutionary science to life. The Tech team curated and custom-built the BioDesign Studio with the help of Local Projects, a NYC-based experience design firm. The exhibition boasts an advisory panel of some of the top biotech experts in the country sourced by The Tech, including scientists, geneticists and educators from NASA, Stanford, UCSF, GenSpace, and Mycoworks.